Why is the price of gold on the rise? The price of gold has been rising steadily over the past few years, breaking the £1,000 per ounce barrier in June 2016 and hitting £995 this week. In fact, the price is up 38.3% since August 2015, driven higher by a variety of global events. In June 2016, gold shot up to £996 per ounce following the Brexit vote, spiking £1,016 in July around fears of deflation causing an global economic downturn. It reached a three-year high in November last year, around the time of Donald Trump’s election in the US. And the war of words between the president and North Korea in the past week, combined with the fall in the value of the US dollar, caused prices to start rising again – hitting £991 on 11 August. So, why does gold rise in uncertain times? And how do you invest in it? This guide explains. Why is gold considered to be so valuable? Gold has been a valuable commodity for thousands of years – but why? It’s rare – Gold is valuable because there’s a finite stock of it. According to the World Gold Council, around ‘187,200 tonnes of gold has been mined throughout history’ and if you were to try and fit all the refined gold in the world into a cube, each side would measure 21 metres – about the length of tennis court. It’s an alternative currency – Gold is an alternative form of money, and is seen as a place to preserve wealth. It is a safe asset in times of instability because, in spite of rises and falls in its price, gold has never lost its intrinsic value as a store of wealth. It can protect against inflation – The price of gold usually increases as inflation rises and can be used to hedge against it. This is particularly important in the current economic climate, the recent weakening of the pound has caused inflation to rise. It’s a diversifier – Gold is easily tradeable and the market is liquid, meaning you can put money in and out of it quickly. Importantly, gold is an efficient diversifier in an investment portfolio. This means that its price tends not to move in line with many other assets, such as equities and bonds, helping you spread risk. Most physical gold you buy will be ‘small format gold’, weighing less than a kg, in the form of coins and bars. Anything higher than this might be too much for the average investor, as a kg today costs more than £32,000. Gold is usually weighed in troy ounces (equivalent to 31g or 1.1oz). The price calculated using the London AM and PM gold fixing. The common quoted price you see is the ‘spot price’ but, when buying physical gold, you’ll usually pay the ‘bid price’, which includes a premium to cover the cost of refining, pressing, punching and minting the gold. Most investment grade coins contain one troy ounce of gold, equivalent to 22 carats or 91% pure. You can expect to pay a premium of about 3%-4% for a gold coin. the UK’s Britannia and Sovereign. British coins are legal tender in the UK (a sovereign is the equivalent of £1) and exempt from capital gains tax. Most gold bars are 99% pure and weigh between 2.5g to 1kg. They’re cheaper option than coins, as they’re not as easily tradeable, nor do they require as much manufacturing and, therefore, the premium over the spot price is lower. You can have your gold delivered to you, but it must be stored safely and insured, as most home contents policies don’t cover investment in gold coins and bars. The alternative is opening an allocated account with a broker. You still buy gold but it’s stored by the seller, with coins and bars assigned to your name. You pay a percentage fee of the gold’s value to store it. Often, the gold is undivided (there’s no individual piece of gold you own). You can redeem your investment as kilo and 100g bars. In allocated accounts, brokers act as custodians for your gold, so if they go bust, you retain ownership. But investment in physical gold is unregulated and isn’t covered by the UK’s Financial Services Compensation Scheme. A cheaper way to invest in gold is an unallocated account but it’s a step away from physical gold ownership. No particular gold is allocated to you – you effectively own shares in bullion but no specific piece, meaning no storage fees and lower trading costs. But with no physical ownership, your investment may be at risk if the broker becomes insolvent; you become a creditor of the firm and may not get your investment back. When it comes to selling your gold, you’ll encounter a third price – the offer price. This is the price that dealers will offer to buy your gold at and is often at a discount to the spot price. The difference between the bid price (the price you paid for it) and the offer price (the price you sell at) is known as the spread. If the spread is very high, this could erode any potential gains when you decide to cash in on your gold. If you don’t want to own physical gold, you could buy shares in a gold mining company. One of the simplest ways is through a fund, which pool your money with other investors and invest mainly in gold mining company shares. 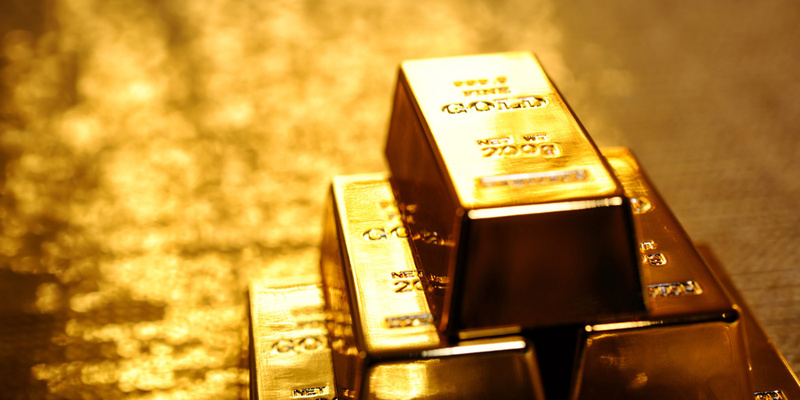 Just a few funds have a specific investment focus on gold, and they can be volatile. For example, between 15 August 2015 and 2016, the Blackrock Gold and General fund grew by 135%. The next year, it lost 24%. Another option is an exchange-traded fund or commodity (ETFs and ETCs). They are a hybrid of a share and an open-ended mutual fund because they’re traded on the stock exchange but can issue an unlimited number of shares. You buy shares in the ETC which are backed by physical gold the fund has bought. The share price tracks the price of the gold. These are passively managed funds which means they can closely replicate the price of the index or commodity and are have lower annual charges than funds, at around 0.4%. But unlike mutual funds, they don’t pay dividends. More importantly, they aren’t covered by the UK FSCS, so you may be exposed to risk if the institution which backs the fund defaults. Much like any investment, the value of gold can go up and down. And while gold might be riding high now, it can also fall dramatically. If you had invested at 2012’s peak price of £1,084 per ounce, you’d have seen the value of your investment drop by 30% over the next four years. With so many factors influencing gold’s price – not just the global economy and currencies but also supply and demand and mining production – it’s nigh on impossible to predict whether this is the top of the market, or there is an opportunity to get a better return. Gold can be a useful diversifier to help spread risk, but it should only play a small part of you investment portfolio alongside other assets such as shares, bonds and property.